This building is shown in figure 2-10, view A, and you areequippedwithahugesaw. Ifyousawedthe building in half horizontally and looked down on it from above, you would see the complete outline of the building (view B). This particular view directly above would be called a floor plan (view C). Architects and engineers project their thoughts of a building, not yet built, onto a piece of paper and call it a floor plan. It does not matter that the heights of the outlets, appliances, or building parts are different. These heights will be indicated by figures in inches or feet, next to the symbols that represent them. Electrical construction drawings are floor plans modified by the inclusion of electrical symbols. Figure 2-11 shows an electrical layout superimposed on an outline taken from an architectural floor plan The service line that brings power into the house is a three-wire line in 1 1/4-inch conduit. The service line feeds power by way of a service switch to a lighting panel, from which three branch circuits run to the lighting fixtures and convenience outlets in the rooms. The symbols for these fixtures and outlets and the service switch are shown at the bottom of figure 2-11. An elevation is a drawing that represents a view of the finished structure as you would see it from the front, back, left, or right. 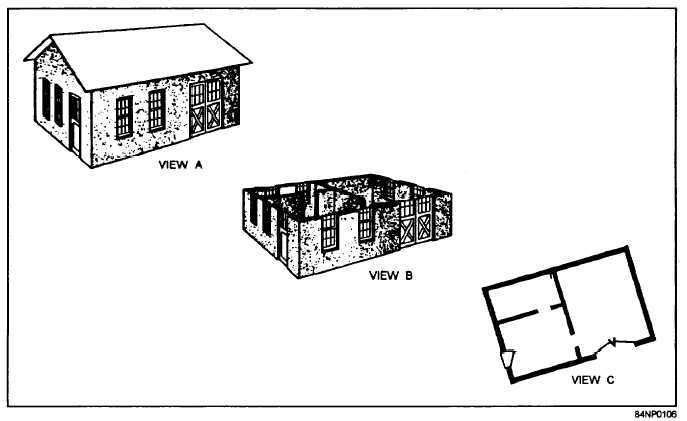 There are interior elevations, such as a view of a fireplace, as well as exterior elevations, as shown in the elevations of a small building shown in figure 2-12. Doors, windows, shapes of roof, chimneys, and exterior materials are shown. These views provide the viewer with a finished appearance. Figure 2-10. - Floor plan development.